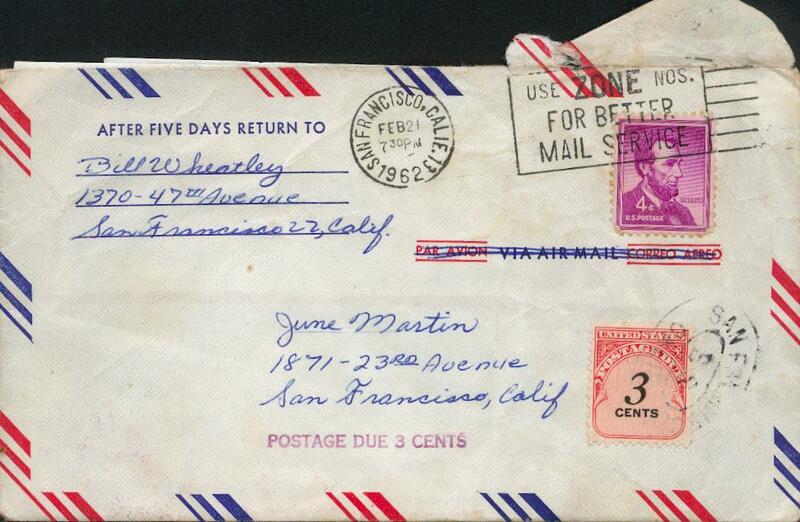 For years I’ve been carrying around a letter, still in its original envelope, stamped 1962. It’s a letter from a 16-year-old who thought he liked me a lot and wanted me to know that. Bill actually sent the letter via the post office–we lived about 20 blocks apart. What a romantic. I was barely 14 and flattered at the attention, I’m sure. Bill Wheatley didn’t live to see the world I’m seeing now. And when you get to be my age you really know you really feel how young 15-16 is. A couple of posts ago I talked about the barts and gangs, one of them called the Athenians, the guys who wore the purple jackets and spent a lot of time on their greasy hair. Bill Wheatley was an Athenian. I didn’t know him or his friends that long. They were all very nice guys, actually. Not tough at all, like you were supposed to think they were. I saw him save a puppy’s life once. But Bill did scare my parents. He was very tall and wore that purple jacket and came to my house. My parents wouldn’t let him in. 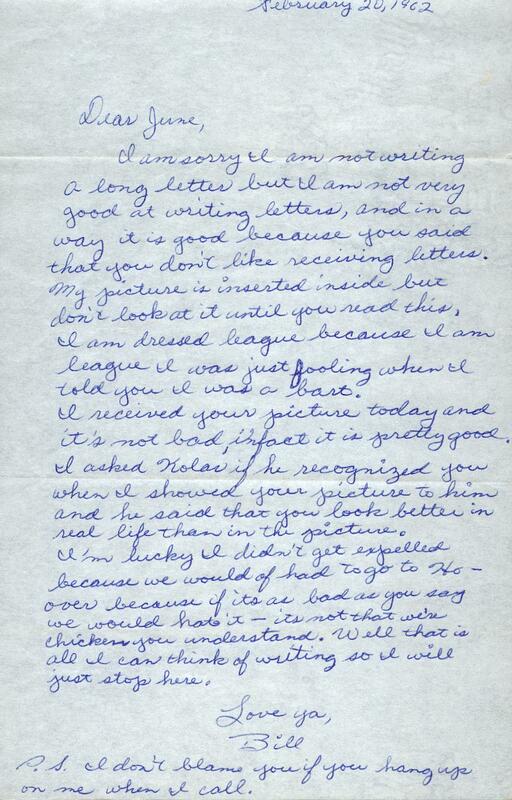 I can’t recall the details–but here’s the letter from Bill, a teenager who thinks he’s maybe in love. He was a kid. My maiden name was Martin. Maybe I knew him for six months, I don’t know. I never saw him again. But then several years later I heard bad news. He was 18,still very much a kid, when he joined the Marines and shipped out to Vietnam. He was shot to death soon after he got to the province of Quang Nam; he died on Wednesday, October 13, 1965. All that his known about Bill’s death is that he died as a result of small arms fire. I found William George Wheatley’s name on “The Wall”, Panel 02E, Row 122. I’m glad I saved Bill’s letter all these years. It reminds me that life is fragile and war is vicious.